These take just minutes to make and easy enough for the kids to help! Pour oil into skillet to the depth of a little less than ½ an inch and heat on medium to medium high for about five minutes. In a bowl, combine cinnamon and sugar. Using a small round cookie cutter, cut the center out of each biscuit. Drop dough into hot oil, watching carefully and turning when golden. 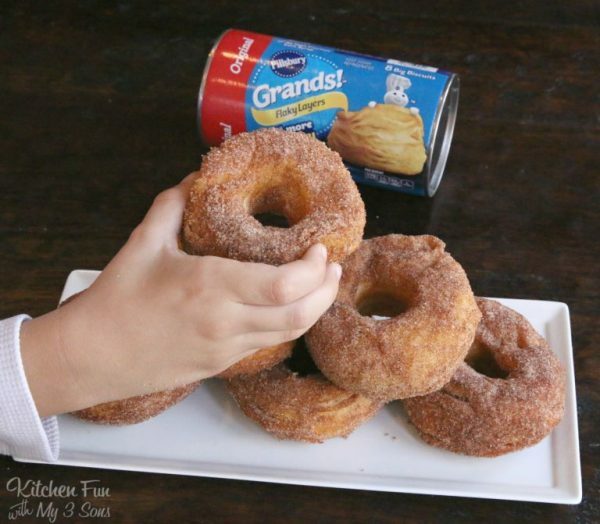 Once doughnuts are golden on both sides, remove to paper towel lined plate. Repeat until all dough is cooked, including doughnut holes. Press both sides into cinnamon sugar mixture. Serve warm.